U.S. President Donald Trump sent a personal letter to North Korean leader Kim Jong-un via Kim's right-hand man who was visiting Washington. Kim was quoted by the North's official Korean Central News Agency on Thursday as saying, "We trust the positive mindset of President Trump and will wait with patience and good faith." 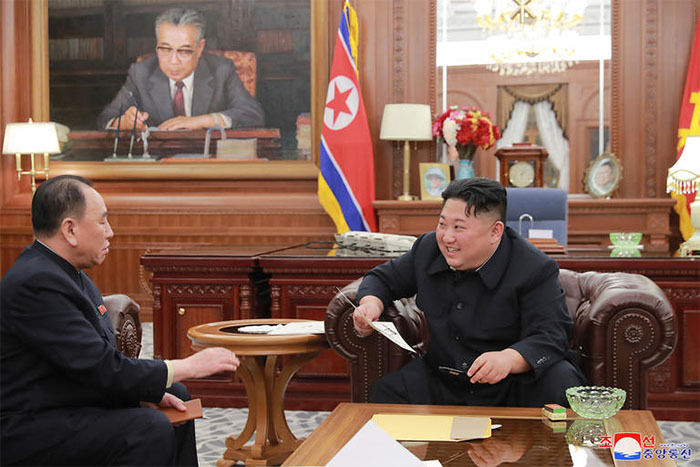 Kim voiced "great satisfaction" on receiving the letter and told officials to make preparations for his second summit with the U.S. leader, according to KCNA. Kim's right-hand man, Kim Yong-chol, was seen in a KCNA photo briefing the leader on the results of his trip to Washington. Next to Kim was the former North Korean ambassador to Spain, Kim Hyok-chol. This is the first time that North Korea's state media has reported on the second U.S.-North Korea summit. But there was no mention of the date and location. Meanwhile, Lee Sang-soo, who heads the Korea Center at the Institute for Security and Development Policy in Sweden, told Radio Free Asia that the North Korean leader may have offered to hand over his intercontinental ballistic missiles to China in order to get Trump to agree to a second summit. Gary Seymour, a former White House official in charge of dealing with weapons of mass destruction, said the U.S. could be willing to accept that, although the best-case scenario would be to either scrap them or giving them up to the U.S.